Furmiliar events can start to trigger after you have your Furmiliar at 5 hearts of friendship or more. Walk into South Westown from the Crossroads after 18:00 to run into an event where you magically transform into a small dog and help your Furmiliar with finding Noel's lost cat, Lucia, who had wandered away from Noel to try and find a replacement for the flower that Colin had given to Noel. You'll be turned back into a human by Dessie after reuniting Noel with her cat, but that's not the end of your animal adventures! 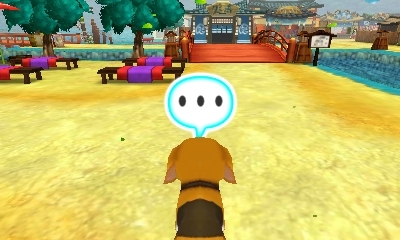 Starting at least 20 days from the date you have your doggie adventure, walking into a north area from a south area for the first time that day (for example, walking from South Tsuyukusa to North Tsuyukusa) may result in Dessie's spell reactivating. This will turn you back into a doggie! Since you're stuck like this for a little bit, you'll decide to stroll through the town while you wait. You can then choose two spots to walk around in, in which case you might trigger an event. If the location you chose doesn't have an associated Furmiliar event, you'll still help out with tasks. Dessie will be pleased with your kindness and give you a reward such as a little bit of friendship with the villagers. Sometimes you'll dig up an item or two. After you watch the cut scene you'll turn back into your human form. You'll then have to wait another 20 days before walking into a north town can activate your dog form. Note that during Winter some of the events won't trigger because the wild animals associated with the events aren't around. Also, if you haven't met the requirements for the wild animal event to occur, selecting the location of where the event would of happened will result in simply locating an item on the ground.